So today we went shopping, and my girl found this one. 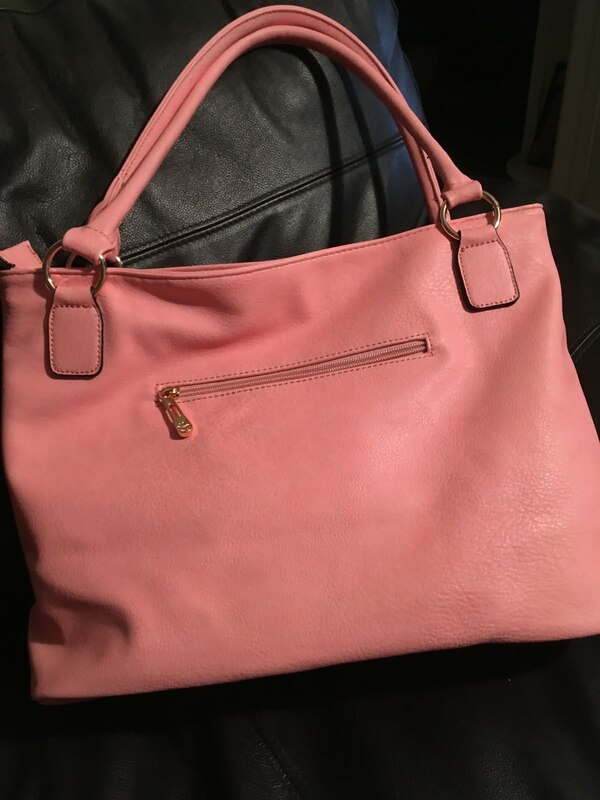 A pale pink faux-leather handbag big enough to fit her packed lunch box/school diary/pencil case/rain mac/purse/phone into. All the essentials. She was utterly delighted with it. I swear that she was more thrilled with her cheap and cheerful shoulder bag than a reality star from The Only Way Is Essex would be with the latest Louis Vuitton. * (*Please note, I couldn’t name anyone from that show, and I had to Google ‘popular designer handbag brands’ to make that comment. I can tell you the name of the drummer in The Pogues, though, so I do know about important stuff). 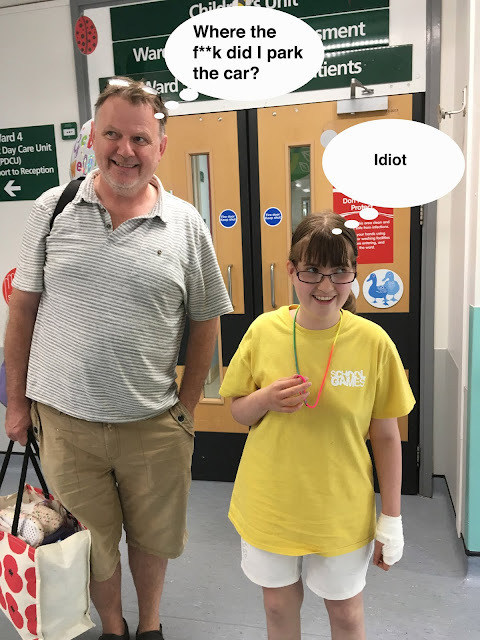 We followed up our shopping expedition with a scheduled appointment with my daughter’s neuro-psychiatrist, where The Prof was duly amazed at her animated chit chat (my girl is normally a little shy with him). I explained that I didn’t think it was a sudden re-occurence of the extreme highs (part of her mild bi-polar type mood disorder that he has helped keep under control brilliantly over the past couple of years). “She’s just on a handbag high,” I explained. “Ah, my wife has those,” he nodded. Song is Shane MacGowan And The Popes - I'll Be Your Handbag. It's inappropriate and sweary. But that's the POINT. 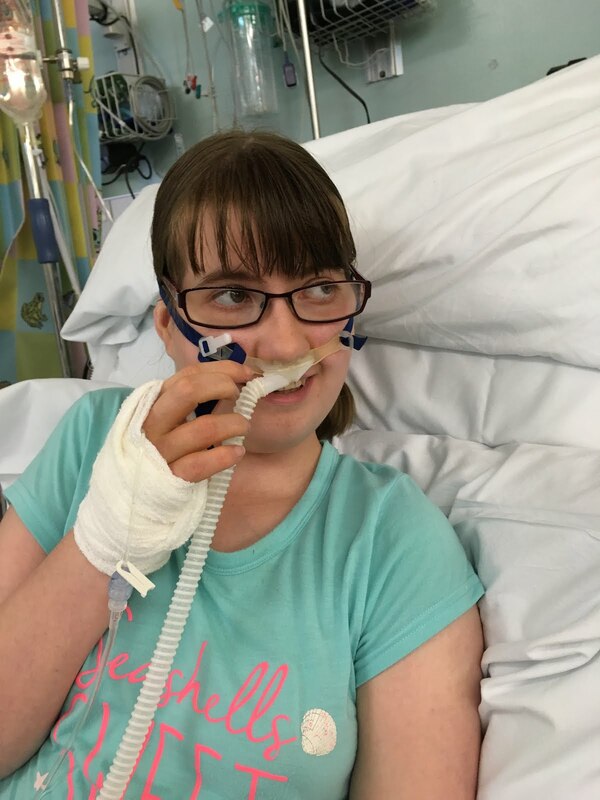 I have been informed by my daughter that her dad is better at shaking the water out of her oxygen tube than me. And that he makes a nicer hot chocolate. And he 'sleeps better'. He replaced me - rather too effectively for my liking - last night. I got some proper, luscious, soul-restoring sleep in my own proper, luscious, soul-restoring bed (and I might even have gone out beforehand, watched a band, and had a drink or two, or three. You might think that, but I couldn't possibly comment). 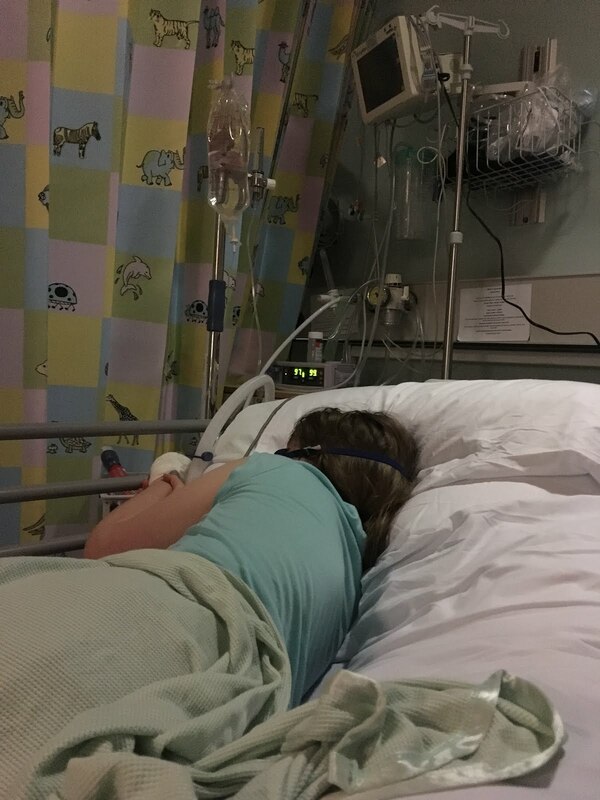 I returned to hospital to find my girl another few steps on the road to recovery from pneumonia. She's on 21% oxygen now (essentially air, but still needed to help her airflow). Earlier she tucked into a Sunday dinner and om-nom-nommed. I restored my Mum Is Occasionally Better Than Dad status by bringing her two things she's not had before: 1) A little snack tub of Wasabi peas and 2) some no-sugar Capri Suns. The latter items were received with actual awe - it's the first time I've ever seen a no-sugar version of what she wistfully calls the 'pouchy drinks with too many calories', so I snapped up a few multi-packs from the supermarket shelf. My girl held one with Holy Grail-style reverence and examined the packet, wide-eyed. "They're only 10 calories, Mum, only 10!". I was convinced this would be the highlight of the day, but I was proved wrong. The topper of the toppermost moments was when two of my nieces came to visit their cousin on the ward. My girl was thrilled, especially when a nurse asked if they were her sisters. She was tickled pink with this - and that's the thing, that's the brilliant, brilliant thing: she is pink now, not the horrible, pale, grey colour she was a few days ago. Life is starting to look more normal. Oh, oh, oh, what a difference a day makes. She's turned the corner. 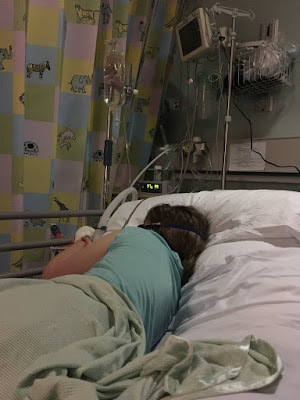 My daughter's infection has started to shift. Air is getting into that left lung. Oxygen has been reduced from nearly 60% to 28%. She's perkier, more anxious, and more nosey about her ward neighbours. My lovely husband is at the hospital and has sent me home. He is dealing with the return of her repetitive questioning (which I was thrilled to see come back, but probably wouldn't have been after six or seven more hours of it). I'm bloody well going out. Yes, 'out' out. I'm on the train to that London to see a couple of friends perform in their band The Disappointment Choir. I am not disappointed about this. I am going to have a MASSIVE gin, meet some long-time-no-see mates, catch the train home (setting phone and watch alarms so I don't sleep past my stop), and then get approximately 10 hours kip. Today has, and will continue to be, a very good day. I am on a children's ward with my girl. She's been uncharacteristically off-colour for a few days. Really lethargic, and with a niggly little cough. 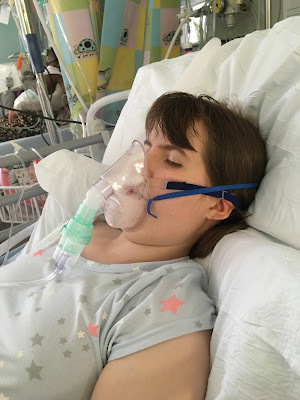 This morning, I took her to a duty GP at her medical practice, who listened to my worries (about how she's never 'ill' ill, about her high pain threshold potentially masking problems, about how she seemed to be unusually tired). 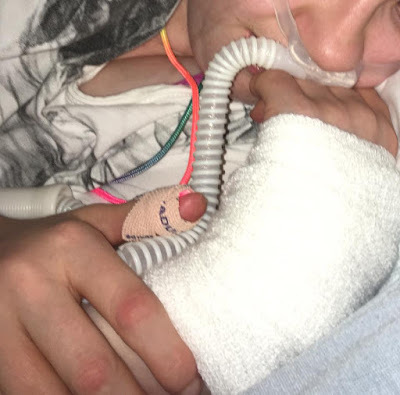 He didn't dismiss me as an over-anxious mum, and sent us to hospital. 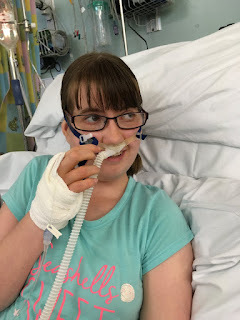 A few hours, a few examinations, and one X-Ray later, she's in bed, in a packed ward, with oxygen being piped through her nose, and getting intravenous antibiotics for a chest infection that I suspect will keep us here for a few days. She's been watching Eastenders on a telly by her bed, with the audio being fed through the earphones I happened to have with me. I, on the other hand, have been listening to the sound of five - count them, FIVE - babies screaming. [Struggling to post a song via my phone in hospital, so just imagine the video to Beastie Boys - Sabotage (from the album Ill Communication)]. We’re into the second week of the summer holidays. I’m still sane. My boy spent five mornings of the first week at the Baptist Church Holiday Club. He’s going to the Anglican Church Holiday Club later on in the holidays because I believe in a multi-faith society, particularly when it comes with cheap as chips childcare. Meanwhile, my girl read. And then read some more. In fact, she’s completed the library’s Holiday Reading Scheme already, which a weight off my her mind, my mind, and everyone’s mind. 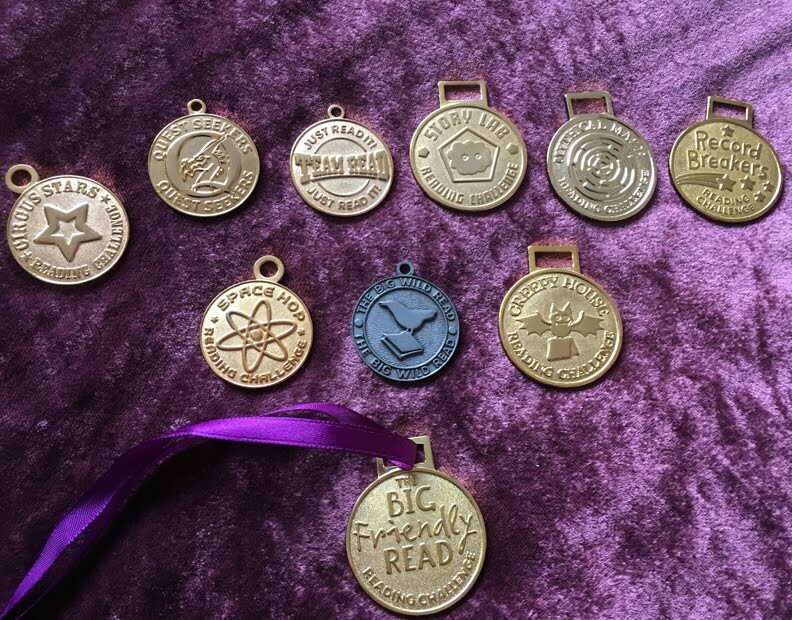 After years of taking part in the scheme, - which requires children to read six books to get a certificate, but 18 if they want a medal - she’s finally stooped to the tactic of choosing really easy books. (When I’d previously suggested this to her, I’d got short shrift). So she’s read ’em already, and got another medal for the collection (the one with the ribbon, pictured). 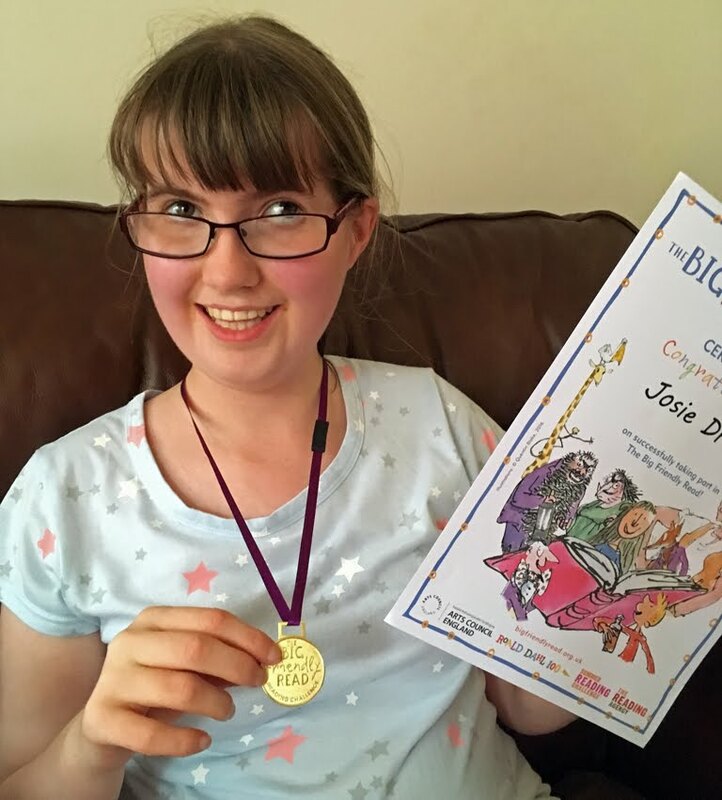 This is despite her being over the age limit for the scheme now, and being encouraged by the ‘library lady’ each year to switch to the scheme for older teenagers. She’s still got her nose in a book, mind. She’s reading Harry Potter, in preparation for our upcoming visit to the Warner Bros. Studio tour. We’re going to watch the films again, too, although with some tricky pausing and forwarding. “I don’t want to see You Know Who, because I’ll have bad dreams,” she decrees. So we’re going to have to do a Harry Potter marathon minus the Voldemort bits. It’s given me an idea: if my little lad wants to watch the Godawful Star Wars prequels, I am only going to agree if I can apply a similar censoring technique, and cut out Jar Jar Binks.